UDM Downloads > Animation from Movie! 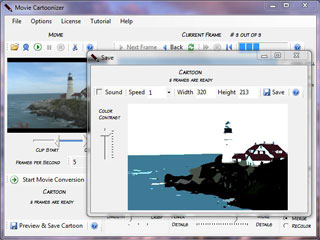 Converts movies into animation clips. Making animation never been so easy. Just load a movie or home-made video (in avi, wmv, asf, mpg or mpeg format), click a button and view the result animation. The animated clip can be saved in avi or swf format and can be easily included in a web page. Check our website http://www.caricature-software.com for example animated clips produced with this program. Animation from Movie complements PhotoS software http://www.caricature-software.com/products/photos.html that converts photographs into line drawings.